The GoSkydive, Tandem Skydive Instructor Apprenticeship scheme is the first on its kind in the world with all skydive ratings and licences coming from the British Parachute Association (BPA). Designed by GoSkydive founder and BPA councillor Gordon Blamire the scheme is a result of the year on year growth of this high adrenalin experience. For some, tandem skydiving is the very start of an interest in skydiving as a hobby and sport but for the new majority it is a once in a lifetime experience and a life changing event. Exceptional Customer Service is at the heart of the GoSkydive brand and is a major part of the apprenticeship programme. GoSkydive Tandem instructors are required to not only be fully qualified, full time professionals, they need to manage the range of emotions that first time skydives bring, they need to be committed to delivering the best experience for every customer every time, they need to understand that every element of the customer journey is part of the tandem skydive experience and they need to fully appreciate how it is delivered. Parachute handling skills and improving freefall skills with particular focus on camera flying skills. Focus on flying relative to tandem pair. Complete all requirements for C license, demonstrating a high level of competence. 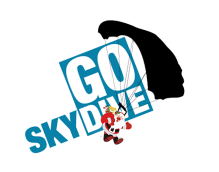 GoSkydive is a young, vibrant, growing company, employing customer focused individuals with a can-do attitude. The GoSkydive Apprenticeship Scheme is an exciting opportunity for young people to join the GoSkydive team, gaining experience in all areas of the business with the ultimate aim of becoming a specialist tandem skydive instructor and the potential to manage a customer centric dropzone. A minimum of 5 GCSE’s grade C or above including Maths and English. A relevant tertiary qualification; this could be in sport, customer services, hospitality, tourism or any area that the candidate can clearly align with the role. Send your C.V and a two minute video explaining why you are perfect for the position. We’ll review your application and get back to you within 7 days. If you have any further questions you can email the operations manager directly via tom@goskydive.com.